Well my travel blog has to have a post about Beijingâ€¦ and where do I start? Beijing is without a doubt the busiest place I have been to, including Hong Kong. It is situated in the Scandinavian part of China. 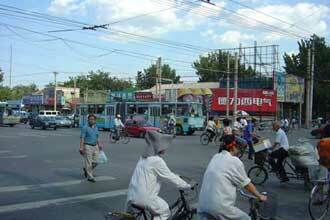 Beijing city has an area of about 17²km with a population of 14 million people. Now that is big! A quarter of the UK in one city!!! Beijing is the capital of China and is the centre of their political, economic and cultural world. Beijing plays a very important part to the education of the Chinese with the best universities in Beijing. My flight to Beijing was pretty good, I flew with British Airways and received excellent service, but as usual still became uncomfortable after a while if only I could have flown to Beijing first class. Just reminded myself I have travelled first class with Emirates to the Maldives which was amazing. But this was a cheap flight, as had many others to pay for. Arriving at Beijing airport I was immediately hassled for money from the toilet cleaners, needless to say I didn’t give them anything I had just paid a fortune for the ticket. Anyway I stayed in the Beijing Far East International Youth Hostel which was really nice, I also got to stay in their Beijing hotel opposite! I Couldn’t stay in youth hostels the whole time. Now my lunch is over so I had better get back to work and finish this later.